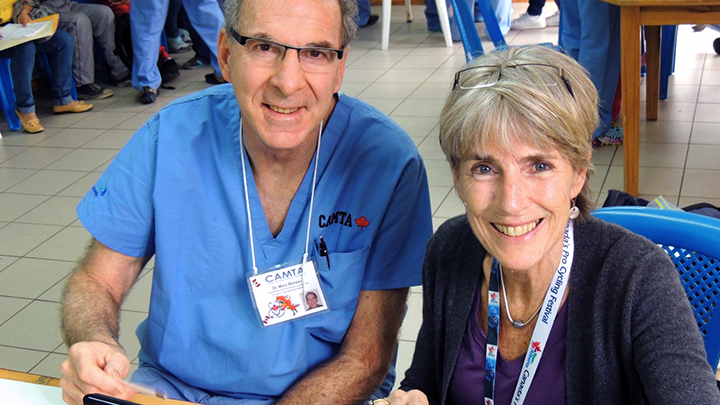 Dr. Marc Moreau, a pediatric orthopedic surgeon at Stollery Children’s Hospital, and his wife Barb founded the medical charity CAMTA (Canadian Association of Medical Teams Abroad) 18 years ago. Since then, they’ve brought a team of 100 healthcare professionals, students, translators and logistics people to Ecuador for two weeks every year to perform life-changing orthopedic surgeries for adults and children. EDMONTON — It’s been 18 years since Dr. Marc Moreau, based out of the Stollery Children’s Hospital, and his wife Barb along with a small core group founded the Canadian Association of Medical Teams Abroad (CAMTA), a medical charity near and dear to their hearts. Each year it brings a team of 100 healthcare professionals, students, general lay people, translators and logistics people to Quito, Ecuador for two weeks to perform life-changing orthopedic surgeries for adults and children. But Quito has only been one stop on his international journey. This guy gets around. Moreau or members of his research groups have presented lectures and research findings — including an astounding 353 oral presentations — in Alaska, Vietnam, Japan, Poland, France, England, Scotland, Switzerland, Greece, New Zealand, China, Belgium, Dominican Republic, Mexico, the U.S.A. and every major centre in Canada, to name a few. His deep love of medicine and a desire to give back to the community for his life’s many blessings were instilled by his father Joseph, also an orthopedic surgeon, who practised at Edmonton General Hospital back in the day. And also by his wife of 44 years, Barb, whom he fondly recalls meeting in the library of the Edmonton General Hospital when she was all of 21 and a nursing student. True to their word, when their three boys and two girls came of age, they helped create CAMTA, which sees two teams of 50 converge in Quito, at the Hospital Padre Carollo – Un Canto a la Vida, where they perform their surgeries. Their healthcare colleagues fundraise to pay their own way from where they live and freely give up their vacation time to help the less fortunate who otherwise would not get the surgeries they need to lead better lives. Lining up patients, medical personnel and donated supplies — not to mention getting the logistics right for such a hefty team — is a year-round job, but the personal rewards are beyond priceless. The CAMTA team roster boasts pediatric and adult orthopedic surgeons, anesthetists, family medicine doctors, respiratory therapists, physiotherapists, operating room, recovery room and ward nurses, residents, nursing and medical students, lay people, general students and translators who work with local hospital staff. Moreau points out that, around the world, one in every 1,000 babies is born with a club foot. In Ecuador, the majority of these children are not treated at birth, making learning to walk difficult. Ecuador also has a high incidence of hip dysplasia, a birth defect which can cripple a person by age 25. Poverty and limited access to medical assistance often means children with these conditions live with pain and limited mobility their entire lives. Adults in Ecuador who require hip replacements, repairs due to injuries, or repairs due to congenital deformities often face debilitating pain and difficulty walking. Employment becomes impossible for those unable to move about — and families suffer the consequences. CAMTA has made a tremendous impact on the lives of the less fortunate. To date, medical teams have notched up 18 successful missions and performed more than 1,200 surgeries and directly benefited more than 7,800 patients and family members, ranging in age from two months to 87 years. CAMTA also inspires volunteers to pursue careers in medical fields, promotes humanitarianism and provides an atmosphere where healthcare professionals can discuss different methods of resolving problems. With their ‘spring chicken’ days behind them, Marc and Barb Moreau are also laying the groundwork to one day pass on their legacy to fresh leadership, to keep the healing magic alive. CAMTA has a lot of moving parts, so to speak, and it’s hardly an assignment for the faint of heart.